Above: One of the twin circles on the hillside below Foxlow Edge. Could they be the remains of a Stone Age settlement? Perhaps this east-facing gap in the wall may offer a clue. The ‘Beast from the East’ is supposed to be returning with a vengeance in the next few days, bringing with it frozen roads, high winds and perhaps even some snow. So I decided to get out while the weather was still fairly reasonable to take a closer look, and some photos, of the features on Foxlow Edge revealed in a previous post. It wasn’t easy finding the large stone-walled circle. The best route is to park in the lay-by on The Street (the start of walk 17), head towards the summit of Foxlow Edge on the left, and then take the lower path as it divides, going through a farm gate. Simply cross the hillside, following the narrow path, and eventually you come to it, on the left, just before the fence which surrounds the field. Although the other circle without any stone border is just a short distance away, I couldn’t find it – athough I must have walked right across it. It only revealed itself on an aerial photo taken when the ground was very dry (above). And today the ground was wet, green and more over-grown. So perhaps it wasn’t surprising. Both circles measure about 35m across. I hoped they might be the remains of a couple of ancient stone dwellings. But Anna from The Peak District National Park Authority’s Cultural Heritage Team said this is too large for a typical stone hut. Adding that they were probably enclosures of some kind, perhaps relating to the “former designed landscape around Errwood Hall”. 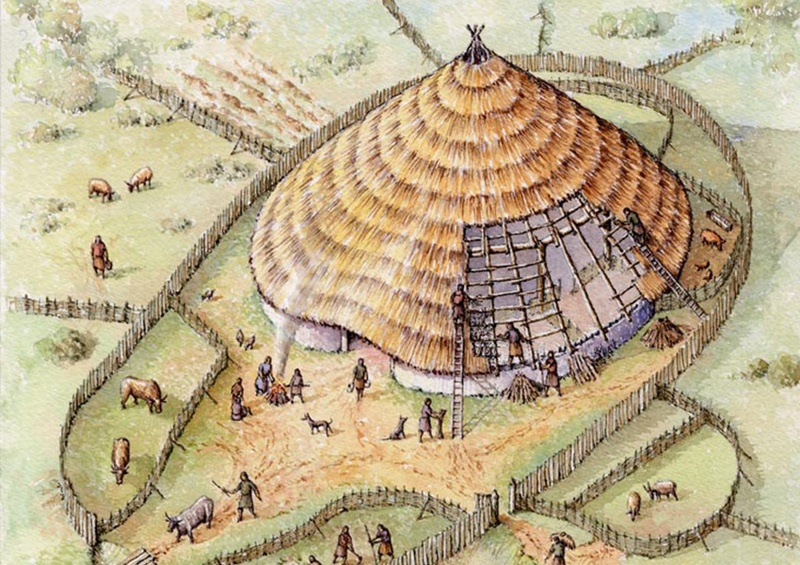 Chris, who has a Facebook page on ancient sites, landmarks and roads of the High Peak, then got in touch to say that a recently uncovered Bronze Age house in Omagh, Ireland, was of a similar size, and sent a link to the illustration below. Which rekindled my hopes. Above: Illustration of Golan Bronze Age house courtesy of Northern Archaeological Consultancy and Philip Armstrong. I got in touch with Colin Dunlop, Project Manager for the consultancy leading the Omagh dig, to get permission to use the illustration, and took the opportunity to ask what he thought about the twin circles on Foxlow Edge. I would guess that the low stone wall may indicate that this particular site was a large sheep enclosure as it’s unlikely that a stone wall would have survived from the prehistoric to the present day. However, I would check to see if within the wall there are any larger upright stones as these may be stones from a stone circle, which in the historic period had a wall constructed in between. Two sets of stone circles side by side are not uncommon, but as the aerial seems to show a solid line, it would have to be more of a ditched feature (this could also apply to the one with the small wall). As another point of note, if the structures are domestic, rather than ritual, they are most likely to have openings in the east to obtain maximum sunlight. Ritual sites mostly have entrances pointing to specific astral or solar alignments during the year, or significant landscape features. As with nearly all ancient circles of this size the front entrance is facing due east (rising sun) and the rear entrance is due west and which is smaller: half the width of the east opening. I checked the two gaps in the stone wall using a compass on my phone, and indeed they were aligned east to west – with the larger to the east (see top photo). So I still live in hope! There were a couple more features nearby which Chris thought could be significant. I’ll cover these in another post. Meanwhile, any thoughts or comments would be welcome.